Track the patterns of your beating heart with ECG 2 click. ECG 2 click contains ADS1194 16-bit delta-sigma analog-to-digital converters from Texas Instruments, a built-in programmable gain amplifier (PGA), an internal reference, and an onboard oscillator. Track the patterns of your beating heart with ECG 2 click. ECG 2 click contains ADS1194 16-bit delta-sigma analog-to-digital converters from Texas Instruments, a built-in programmable gain amplifier (PGA), an internal reference, and an onboard oscillator. 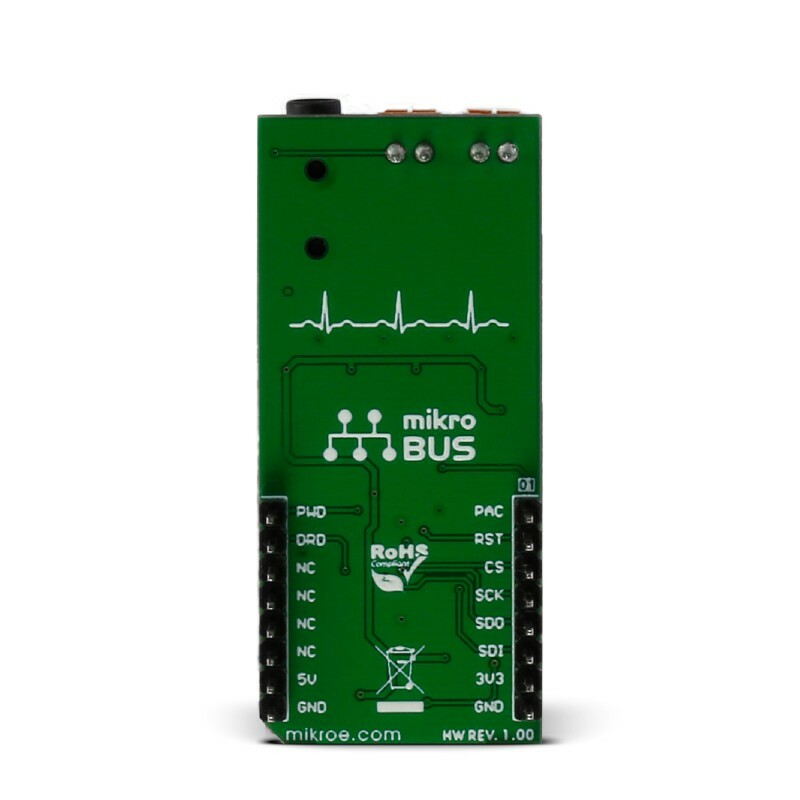 The click communicates with the target MCU over SPI and the following mikroBUS pins: PWM, AN and INT. 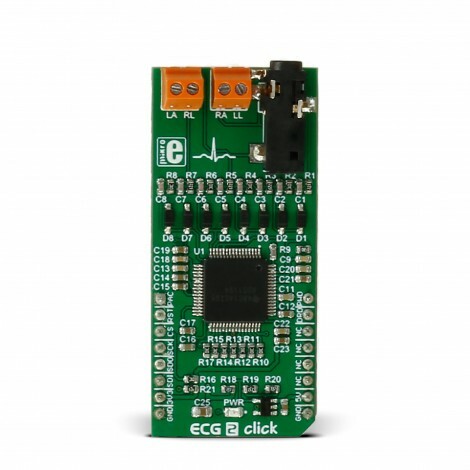 ECG 2 click runs on 3.3V and 5V power supply. Of course, you will also need a target board with an MCU (preferably powered from an external battery). 1. For 3 wire measurement, a 3.5mm jack is used. You can connect the click to a person using three electrodes placed on the left arm, right arm and the left side of the abdomen (below the heart) or alternatively on the left leg. We offer cables and electrodes that are marked (left leg (LL) – red, left arm (LA) – black, right arm (RA) – white). 2. For 4 wire measurement, screw terminals are used. ECG 2 click can also be connected by 4 electrodes that are placed on both arms and legs. MikroPlot is a free data visualization tool (Windows) that can be used to generate an ECG. The graph is generated from data sent from the MCU (ADC values from ECG click input + time stamp). 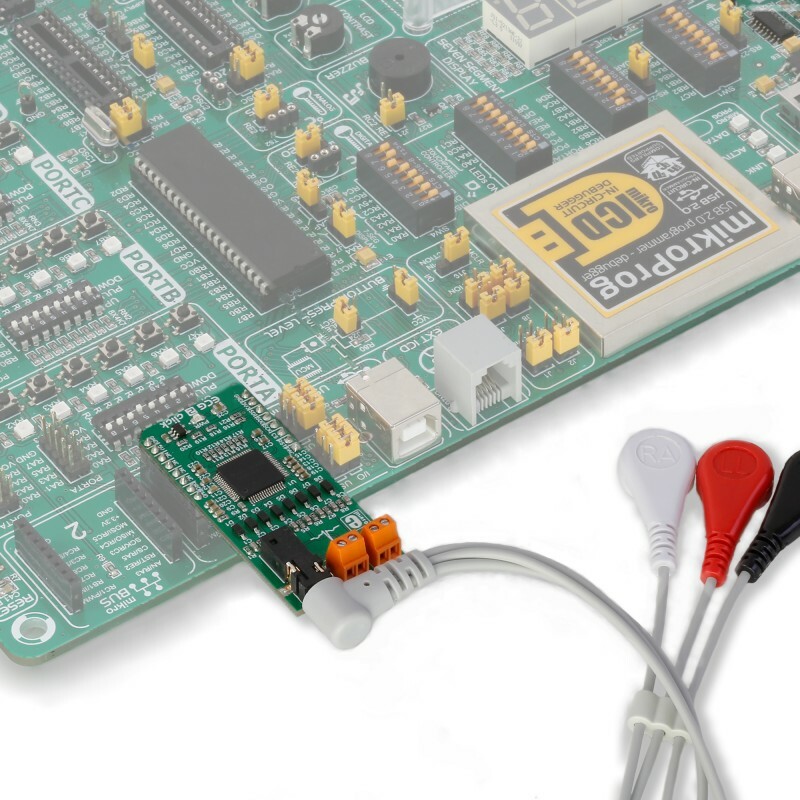 A UART-USB connection is required. See the learn.mikroe.com article for more information. 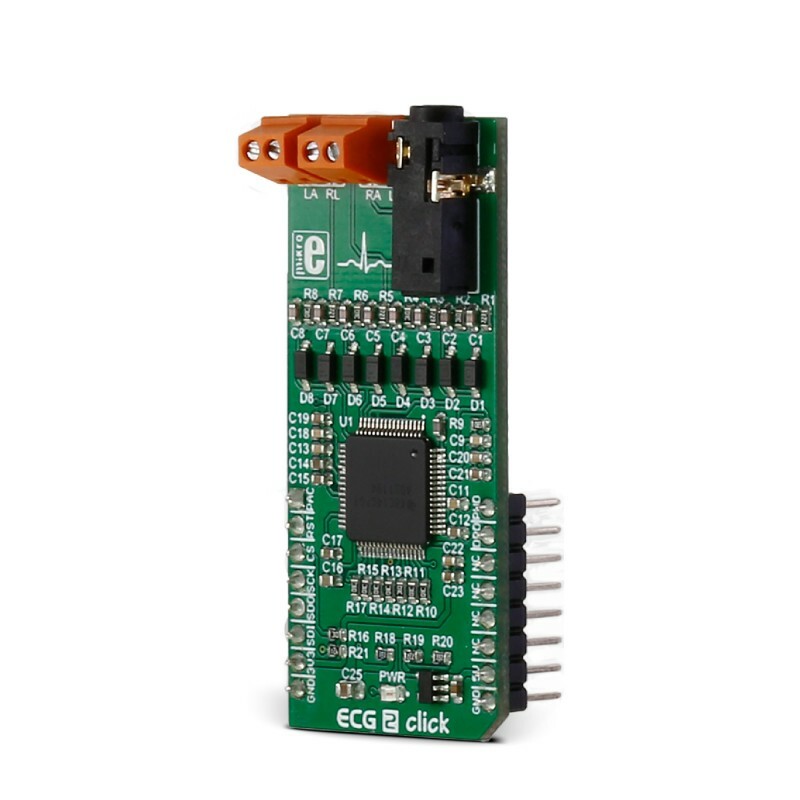 ECG 2 click uses both 3.3V and 5V power supply — 3.3V is used as digital power supply and 5V is used for analog power supply (via linear regulator which gives stabilized 3V at output). OverVoltage and OverCurrent protection is realized over 22k resistors and diodes. Measures the electrical activity of a beating heart through electrodes taped to the skin. DISCLAIMER: ECG 2 click is a prototyping tool, not a medical-grade device. Do not use it to diagnose patients. Key Benefits Ready-to-use example and free software tool to generate ECG plot, record ECG while you watch TV, read email, talk over the phone – study patterns to see what excites you (HRV - heart rate variability is a good indicator of state of mind). This table shows how the pinout on ECG 2 click corresponds to the pinout on the mikroBUS™ socket (the latter shown in the two middle columns). ECG2 click works best with a battery power supply. In cases where the board is powered through an USB cable, a periodical 50Hz noise will occur on the ECG signal. To counter this noise, the user must place their left hand on the ground pin of their development board. Code set's up the ECG2 click, measures ECG and sends data to MikroPlot application.